Blanch the palak & make it cool & grind to a fine paste. Heat oil add sliced mushroom ,salt & saute until soft. Heat oil in a pan, add cumin seed,onion, ginger garlic paste,tomato & saute few mins. Add palak paste,nutmeg powder & mix well. Add mushroom & saute few mins. I am new to your blog.That was a lovely recipe you posted. Looks simply delicious. Wow thats wonderful combo....great sidedish for roti. Lovely dish and do participate in my two events. 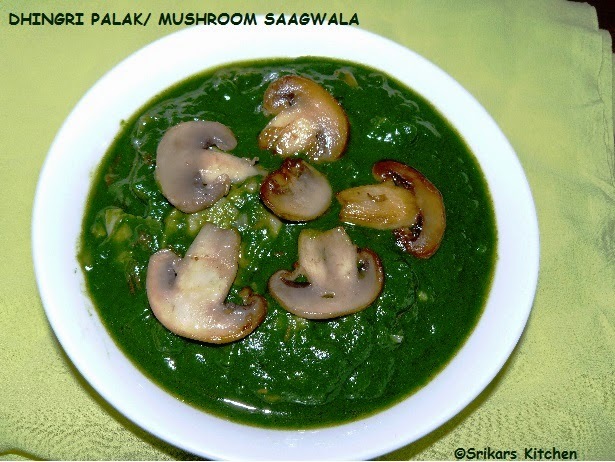 I'm not a mushroom lover, but I will use this recipe to combine palak to somethingelse. Loved the masalas in the dish. Mushroom and palak seems both works wonder..lovely dish.. This looks really amazing...nice recipe..